The slewing potential increases reaching speed, above. The larger design also reaffirmed the effectiveness of Catapult's simpler design. 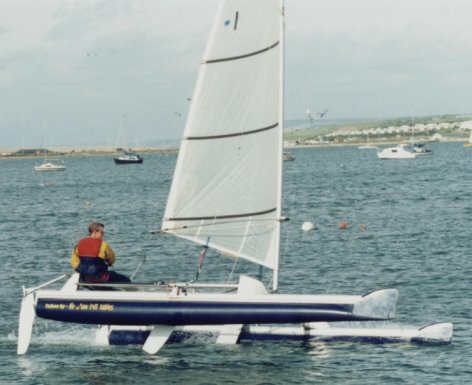 As a one off development project, the 5.5m inflatable catamaran was constructed by Jon Montgomery, with assistance from Topper. The intention was to try out a larger version of the Catapult, as well as to incorporate new technology allowing the hulls to slew. 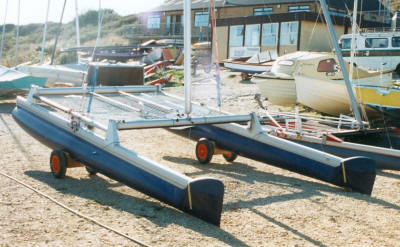 The boat was hand made, utilising existing extrusions and items already available for other boats. The unique feature is the hull slewing - slewing 10 degrees pushes a bow forward 20" but only reduces the beam by a few inches. It was possible to slew the hulls whilst sailing, which shifted weight and modified the waterline length. Alex Montgomery comments that it was quite a strange experience to do this whilst sailing, controlled via a block and tackle. Around 15 degrees seemed the best combination. The boat had two rigs. 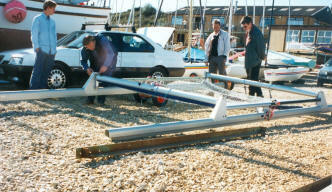 One was a 2 piece Tornado mast (cut down & re-wired) carrying 13 sqm sail. 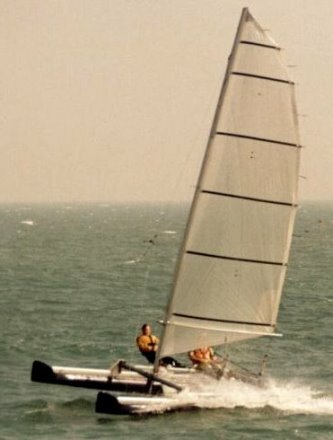 The other is an A class rig, a 9m one piece aluminium wing mast with tapering top section carrying a 13.9 sqm Dacron sail with foam battens. A 7 sqm storm sail was also used at Speed Week.